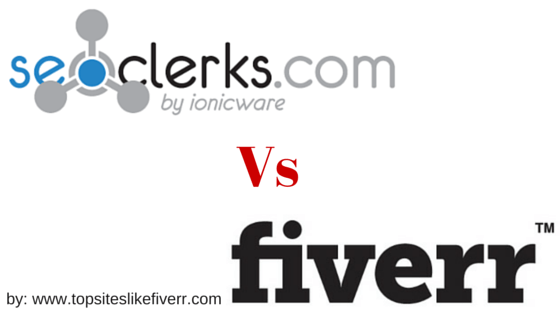 SEOClerks VS Fiverr | Which is Better? In this blog post I will review and analysis SEOClerks and Fiverr. We will see how these sites are different and what they do best. If you want to know which one is better, SEOClerks or Fiverr, then read on. Let us first start with Fiverr. Fiverr is a world’s biggest online marketplace for small task (they call them gigs) for just $5. So, the name is Fiverr. All gigs will cost minimum $5. There are gig extra from $5 to $200. Sellers with better reputations (read Level) have better pricing option for their gigs. Logo Design: On fiverr you can find the gigs who provide logo design services within a deadline. You can find creative, unique logo by best graphic designers. Business card: It is the best way to represent your company or individual to the audience. It can increase your sales and promote your business. Check out amazing, stunning, professional business card at fiverr. Writing & Translation: In this section, you can find gigs for copy writing, translation, press release, speech writing, website content etc. Video & Animation: You can get animated video just at affordable price $5. Animated video can be used for marketing. Fiverr Experts deliver a customized video with their mind blowing creativity. Infographics: Infographic is the best way to describe the brand to the customers. Fiverr is providing this service at just $5. Gigs are providing unique, eye-catching, professional infographic starting at $5. I have used fiverr as both a seller and buyer. It is the best marketplace, having more than 2 million gigs now. SEOClerks is the largest affordable SEO marketplace. It’s only focused on SEO. Fiverr has the limitation of $5 while in SEOClerks you can get bonus sale. Gigs are not limited to the fixed price. Services are provided in a range of $1 to $ 100. If you create a new account, you will get $5 bonus. They used to provide a $2 coupon in the exchange of tweet about SEOClerks. SEOClerks allows you to delete comments on your services, to make it for seller friendly. SEOClerks has the Alexa rank of ~5000. Even you can withdraw a small amount below $10. SEOClerks provide fast support than the fiverr. They will reply your query within 24 hours. In Fiverr you are allowed to write description of 1200 characters. While here, there is no limit in the description. When you refer a new members through your affiliate link, then you will earn 10% commission on every sale. Fiverr clearly have advantage over SEOClerks since they are huge and have millions of users. While SEOClerks is comparatively small they are becoming better in SEO services. They don’t have tons of restrictions like Fiverr and thus as a Seller I would recommend SEOClerks. But in case you are not into SEO services then Fiverr is the BEST option for you. Let us know which you think is the best micro job site in comment.